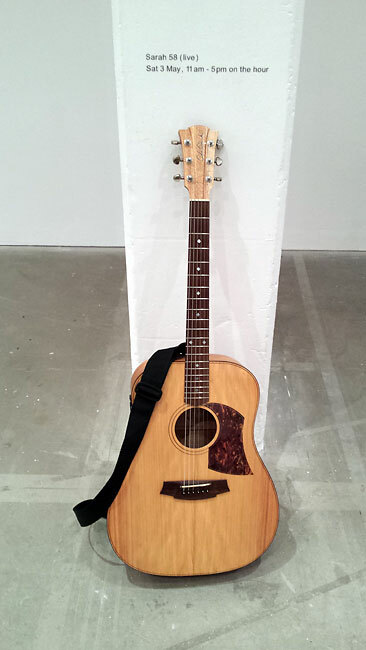 Over the course of the May bank holiday weekend, Bristol’s Arnolfini Gallery staged a series of events under the banner Between Hello and Goodbye: the Secret World of Sarah Records. 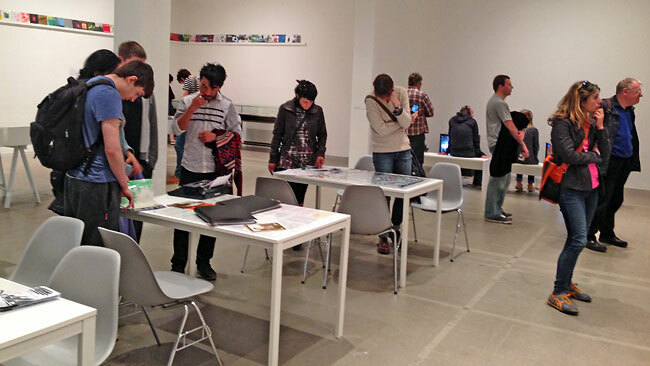 An exhibition of Sarah artefacts (posters, artwork, demo tapes, photos, giant Saropolies…) was held in the main gallery space, Clare led guided walks each day around notable Sarah landmarks, and in the cinema on Saturday evening there was a preview screening of My Secret World (Lucy Dawkins’ wonderful new film about the label – see sidebar) and live performances by three bands – The Orchids, Secret Shine and Amelia, Rob and Pete from Heavenly – followed by dancing in the bar till the early hours courtesy of London’s How Does It Feel To Be Loved? club, relocated to the West Country for the night. Julian Henry, aka The Hit Parade, appearing on the hour, every hour, like a indiepop cuckoo clock, to play both sides of SARAH 58 (sadly not dressed in a large SARAH 58 sleeve as we’d hoped, but you can’t have everything). Giant Saropolies and giant dice in 12″ single bags, yay! Pete joining Amelia and Rob onstage and Shallow bringing back memories of seeing Heavenly for the first time back at the Camden Falcon in 1989 (whilst knowing deep down that those new songs they played might be the best things they’ve written). 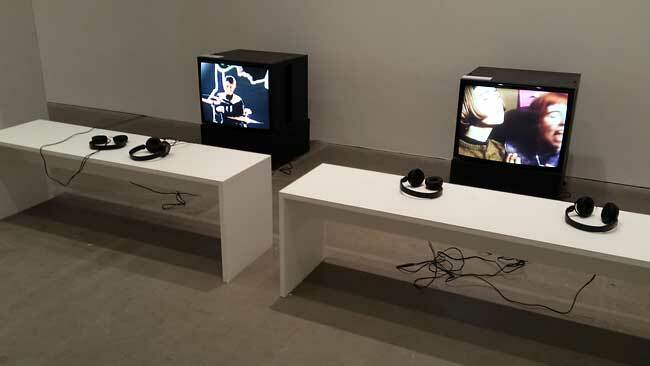 A grandfather and his eight-year-old grandson draped in headphones and intently watching the Golden Dawn video in an otherwise empty gallery. The chorus of Something For The Longing sounding like the biggest thing in the world, and Mr Hackett’s world-weary slapstick routine with his unruly lyric crib sheets (imagine The Tommy Cooper Story starring Tony Hancock and for some reason set in Glasgow). The look on people’s faces when explaining to them that Stewart Boyracer is dressed as a cowboy in the film not because he’s the world’s biggest poser but because he’s a cowboy. No, really, he is. The gallery attendant turning up the volume for the last half hour then dancing to English Rain and Temporal with Snoozy from the bookshop. The three chefs by the bins round the back of Jamie’s Italian (which used to be George’s Bookshop) having a fag while watching in bemusement as fifty-six people photograph the There And Back Again Lane street sign on Saturday’s walking tour. Secret Shine announcing they’d begin their set with “not one of our own songs” and then playing a note-perfect Pristine Christine – and hats off to Kathryn for doing the whole show in a bright-red plaster cast after tripping and breaking her leg (on the plus side, hopefully this will lay those old shoegazing accusations to rest, as she clearly hadn’t been…). The woman leading her elderly mother from the gallery on Friday morning saying “I’m sorry, but I really didn’t understand what any of that was”. 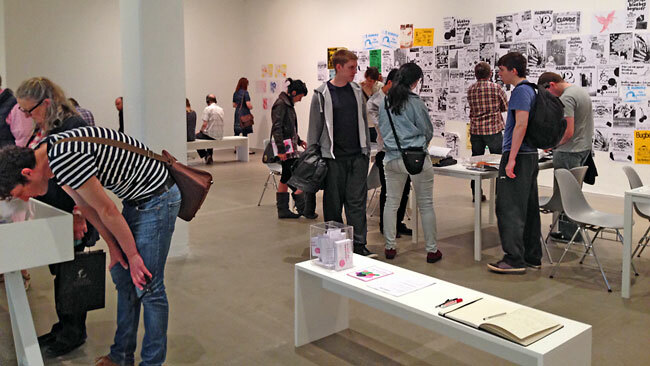 And now here are some more photos (all taken by Lucy Munro). 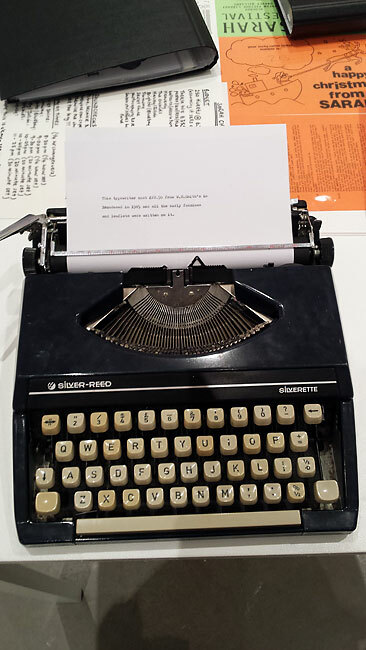 This typewriter cost £22.50 from W.H. Smith’s in Broadmead in 1985 and all the early fanzines and leaflets were written on it. 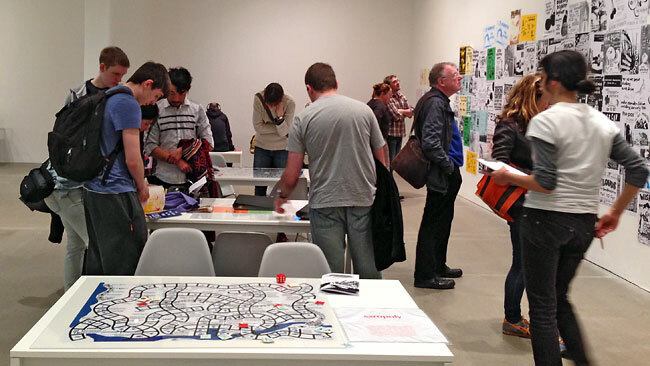 It wasn’t meant to be an interactive exhibit, but teenagers in particular seemed unable to resist the idea of a computer you needed to hit. 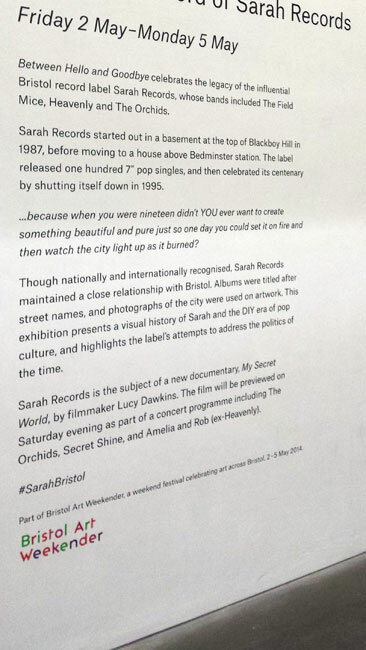 The Arnolfini kindly provided a handy wall-mounted history of Sarah Records for anyone who’d wandered in off the quayside looking for the toilets, or wandered out of the exhibition looking for an explanation. 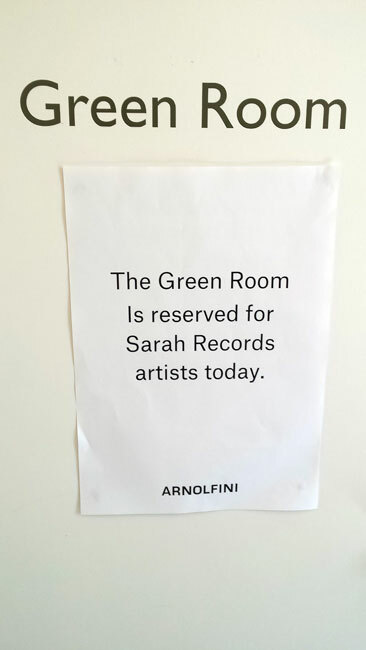 Due to a slight misunderstanding, this room was entirely full of fresh flowers, kittens, blue Smarties and pictures of Mariah Carey. Sarah 58, A and B sides, performed on the hour every hour by Julian from The Hit Parade; sadly the man-size glass vitrine didn’t arrive in time. 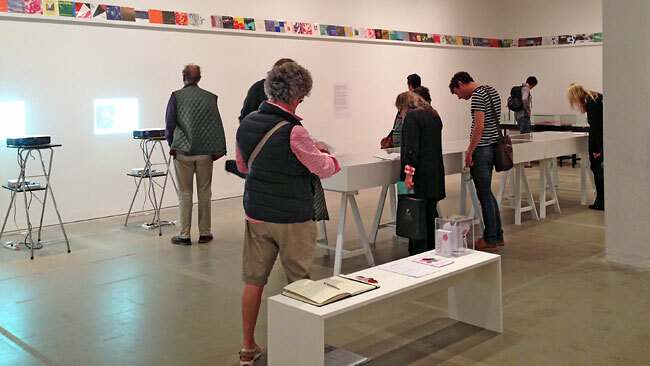 For those confused by the exhibition, a small guide was available from the bookshop; and, if that didn’t help, a wide range of books on other topics. 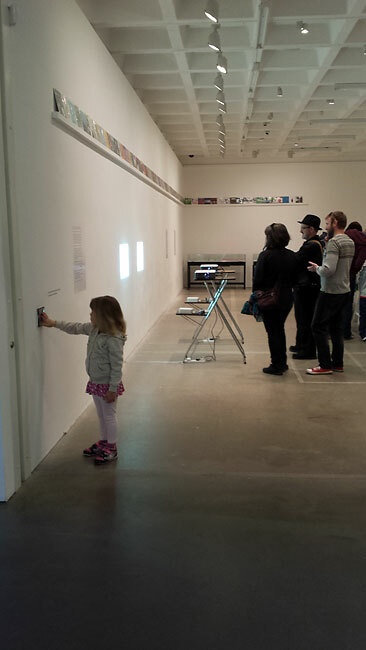 Two small oblongs of white light projected onto the wall just inside the entrance proved especially popular. 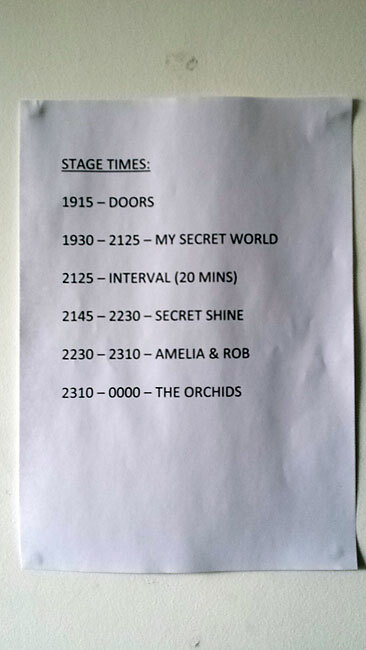 Stage times from the green room. We’d like to thank The Doors for agreeing to go on first, and hope they got back safely to L.A. 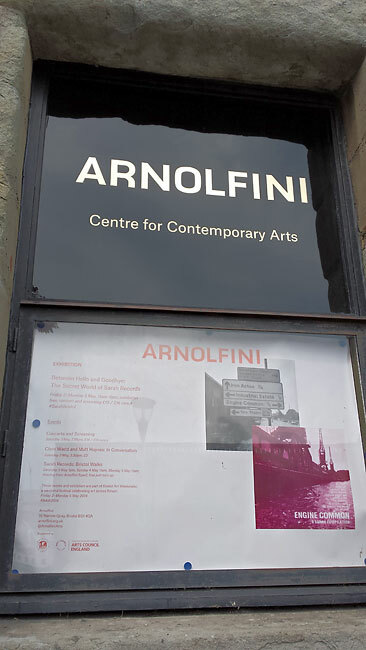 The Arnolfini attempted to lure anyone walking down Narrow Quay into the exhibition with photos of the cranes directly opposite and a signpost showing the way to Yate. 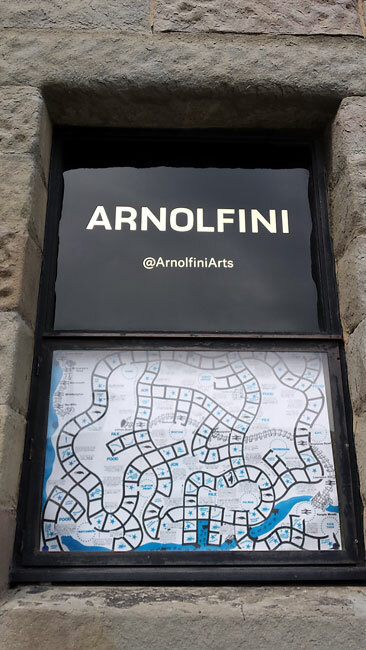 Seeing a giant Saropoly board on public display in the window of the Arnolfini facing Prince Street bridge may well be our proudest moment. 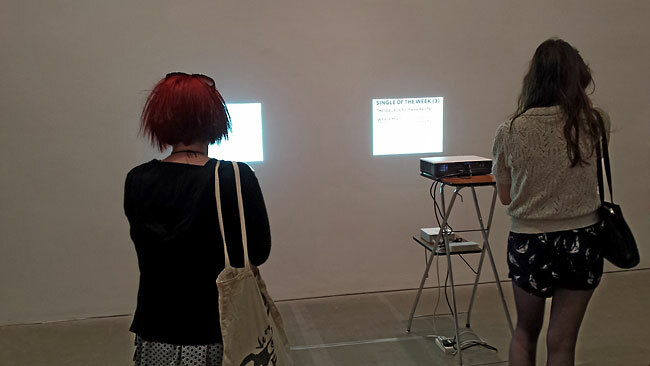 The exhibition introduced Sarah Records to a whole new generation of pop fans, several of whom responded by repeatedly hitting the large switch on the wall in the hope the horrid music would stop and it would all go dark. 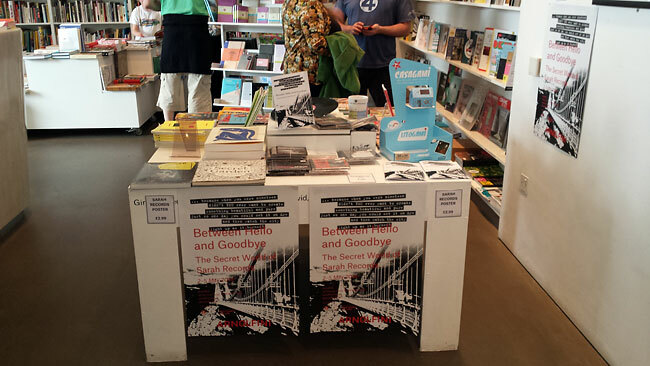 Next weekend (2nd-5th May), there’s a four-day exhibition at the Arnolfini Gallery in Bristol presenting various artefacts from our eight years running the label – artwork, posters, tapes, fanzines, records and so forth. It’s free, and runs 11 a.m. to 6 p.m. each day. The Saturday will also feature a preview screening of My Secret World, Lucy Dawkins’ film about the label, and performances by The Orchids, Secret Shine and Amelia and Rob from Heavenly – tickets for that are £18. 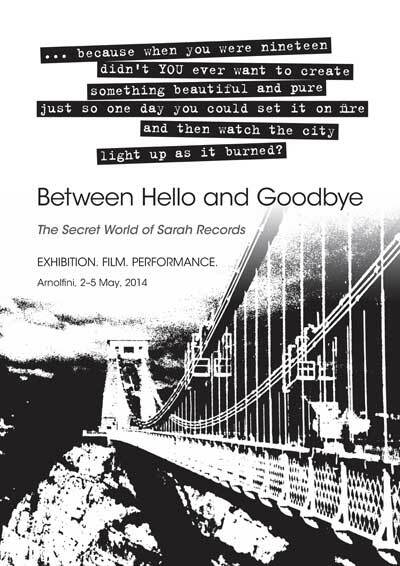 There’s also a Q&A with us, and Clare will be leading walking tours of various Sarah landmarks on the Saturday, Sunday and Monday – that’s all free, like the exhibition, and the whole thing is part of the Bristol Art Weekender, and you can find out more details here.